If you want to enter the business with artificial intelligence, you need an overview of the current use cases. Practical cases and an open exchange of experience – this was the focus of the Eurocloud-Swiss spring event. The examples from medicine and asset management showed that the basis for AI projects is the cloud. Hardly any other IT topic awakens so many hopes and fears as artificial intelligence (AI). Critics who see AI as a threat say that it might be mankind's final invention. As a danger that initially rationalizes the human workforce away, and one day perhaps even abolishes the human being – this is the dark scenario. The optimistic variant, however, is: AI makes it possible for people to finally concentrate on creative tasks again. And above all: AI boosts the economic engine. It enables new business models and makes business more lucrative. This incentive encourages large corporations as well as SMEs to take AI seriously. They are not interested in grey theory, but in practical examples. They need answers to the question of what it takes to start an AI project. And: How do the others do it? Questions like these were discussed by speakers and visitors at the spring event of Eurocloud Swiss. The trade association is committed to promoting cloud computing and sees itself as a bridge-builder between providers and customers, as Eurocloud Swiss President and Glenfis founder Martin Andenmatten said in his welcoming address. "We want to bring people together, discuss and share know-how". If you want to start an AI project, you primarily need data to train the models. Finding suitable training data sets can be difficult. If you can't find anything on Github or Kaggle, you might be able to buy data. Otherwise there is no way around cooperations. 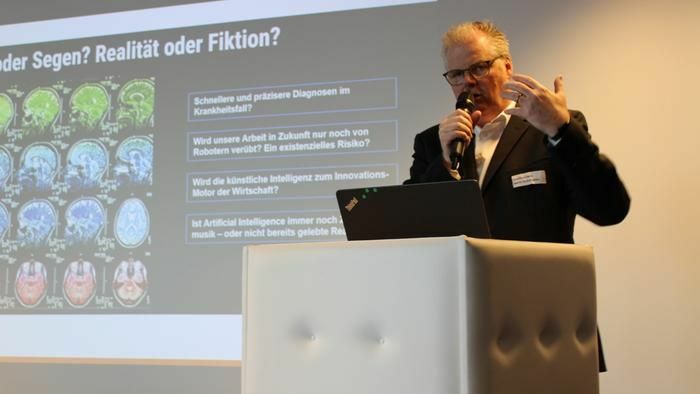 Balzano Informatik gets its data from partner hospitals, as Stefan Voser, Product Manager AI, Balzano, said. The hospitals supplied certain medical image data, in return they received the Balzano solution royalty-free. What is the purpose of this solution? It is designed to help radiologists identify certain pathologies. Balzano works with deep learning algorithms that can detect meniscus tears or herniated discs on MRI images. The software would show such incidents on heat maps. These would serve the radiologists as an immediate second opinion. The solution could also be used to prioritize medical emergencies, said Voser. Based on this use case, Balzano developed an AI development environment called Workbench. The aim is for hospitals to be able to build and train their own AI solutions with this offer. With their own data, on their specific use cases. "Thus hospitals don't have to start from scratch if they want to use an AI solution," said Voser. Medical image analysis is very computationally intensive, Voser noted. Basically, if you want to train neural networks, you need scalable GPU resources. Today, there is no way around cloud providers. "The cloud and APIs are the basis for AI," said Andy Fitze, co-founder of Swisscognitive. They delivered the necessary technology stack. What else does it need? The right talents and leadership. The latter is decisive, because: "Today it is no longer about whether we can do something, but whether we want it". The biggest challenge is to manage expectations, convince people and deal with their fears. Anyone who has acquired training data and can use a cloud-based infrastructure has to deal with development environments for machine learning. Google's Tensorflow, for example, is currently very popular. A framework that Ursin Brunner also works with. Brunner is Senior Software Engineer at TI&M. He presented the second Use Case at the Eurocloud Swiss event. The title of his presentation: Understanding Documents with AI. He presented a solution that TI&M implemented on behalf of Robecosam. Robecosam is an asset manager specialising in sustainable investments based in Zurich. The company publishes - together with Dow Jones – the so-called Sustainability Index. This is intended to evaluate companies according to how sustainable they operate. To determine this index, Robecosam evaluates over 4500 questionnaires annually. The aim of the TI&M solution was to automate the evaluation of these questionnaires and of other documents. And who bears the responsibility? From a legal point of view, there are exciting questions everywhere where AI comes into play. As far as medical use is concerned, it would be necessary to take a close look, for example with regard to medical secrecy, but also concerning data protection law with regard to the EU-DSGVO. Intellectual property law and contract law issues are also hotly debated at present. Who owns which part of the software? Who owns the data? Legal solutions for disputes like these were long in coming. "But as far as liability is concerned, I am convinced that there will be a regulation in the coming years," said de la Cruz.